Since I still had a bagful of turnip greens leftover after making the braised variation, I decided to put them to a different application and make a tart based on the one Heidi of 101 Cookbooks wrote up last month. However, I seem to be out of all purpose flour and we’re not huge cornmeal fans, so I changed up the crust and used alternate flours, namely whole wheat pastry flour and quinoa flour I ground up fresh in my spice grinder with a teaspoon of rosemary. The dough I ended up with was a little soft, and not quite as elastic as an all-wheat flour crust, but it rolled out and baked up beautifully, nonetheless. For the filling, I followed Heidi’s recipe pretty closely, omitting the herbs de provence and grating in a little fresh nutmeg. Amazing how a big pile of greens can be reduced to less than half the volume with a few seconds’ work. After chilling and then parbaking the tart shell (which shrunk very little, to my pleasure), I poured in the frothy green filling and let it cook for half an hour. A few minutes under the broiler with a shower of grated Pecorino Romano cheese, a sprinkle of paprika for contrast, and it was ready to eat. 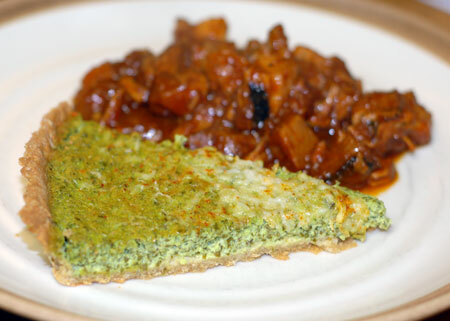 I served my turnip green tart with barbecue pork. This was the same pork I originally made to go with the braised turnip greens a few nights ago. I studiously failed to mention it then, and even went so far as to cut it out of the photos, because it was not a remotely successful recipe. Dry-rubbed with spices, braised slowly in a 250F oven with water in a covered casserole dish, then grilled and basted with homemade barbecue sauce until it was beautifully coated and marked—you’d think this would make for some tasty pork. But the meat was still chewy and full of fat and gristle; I barely even tasted mine, and stuck most of it in the fridge in disgust. While brainstorming accompaniments for the greens tart, I decided to try braising the pork further in a mixture of chicken stock and barbecue sauce on the stovetop. After breaking it down into fat- and gristle-free bites, it simmered for a good hour or so, and became the lovely soft barbecue pork we knew it had the potential to be. We thought the tart was gorgeous, but were not very enthusiastic about the flavor of the tart. The turnip greens were pretty bitter, and the garlic, mustard and pecorino added sharpness without tempering the greens. I actually ate more of it than Jeremy did, and found that the sweetness of the barbecue sauce helped balance the plate. The crust alone tasted very good, although I rolled it a bit thinner than I should have. It was crisp and nutty, and I could taste the rosemary even through the powerful filling. 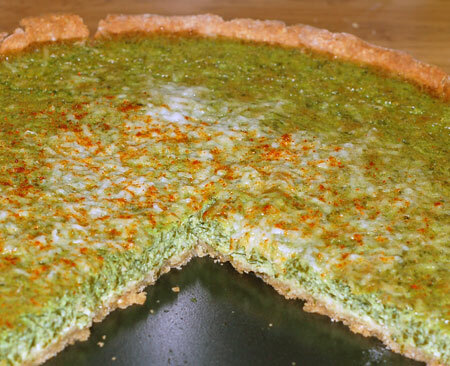 I think I’ll use this crust recipe again in the future for savory tarts, and might try making the filling again with a milder green like kale, spinach or chard. I also wonder if blanching and draining the greens before making the filling would have leeched out some of their bitterness, but I doubt I would have ended up with such a lovely green color. Change up the herbs in this crust to suit your chosen filling or even add a few tablespoons of grated parmesan or pecorino. 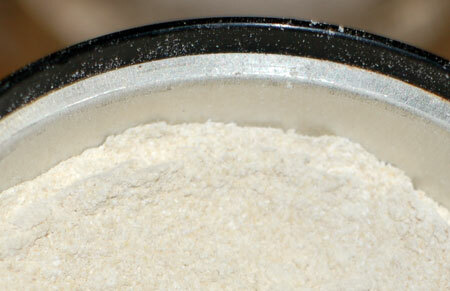 You can either either purchase quinoa flour, or grind it from the dry state. Pulse together the flours, rosemary and salt in a food processor, to blend. Add the butter, cut into chunks, and pulse until it is incorporated and broken down to pea-sized bits. While running the processor, add the water, as little as possible, just until a ball of dough comes together. Remove from the processor and wrap in plastic wrap; flatten out into a disk, and allow to chill in the refrigerator for about an hour. Flour your board well or roll out between sheets of plastic wrap to a thickness of 1/8″ and press into a tart pan, trimming the edges. Chill or freeze for at least half an hour before baking. If you need to parbake the crust for your recipe, dock it all over with a fork, cover with parchment or foil and weigh down with dried beans or pie weights, and bake for 25 minutes at 350F; remove the cover and weights, and bake for a further 5 minutes, then pour in your filling of choice. Makes 1 9″ round tart crust. This mild sauce has a good blend of sweetness, tang and spices, but could easily be adapted to your personal tastes. I liked it because it wasn’t based around ketchup or canned tomato sauce. In a large stockpot or Dutch oven, heat the oil over medium-high heat. Add the onions and garlic, and sauté until tender, about 5-6 minutes. Mix in 1 teaspoon of the kosher salt, the chili powder, coriander, cumin, and chipotle. Stir in the honey, molasses and dark brown sugar. Mix well and boil for about 3 minutes. Stir in the tomatoes and cider vinegar. Bring the mixture to a boil, then reduce the heat to medium low and simmer for about 2 hours, until the sauce has thickened and darkened. Stir in the white vinegar and Worcestershire sauce. Season with salt and pepper to taste (up to about 1 teaspoon of each). 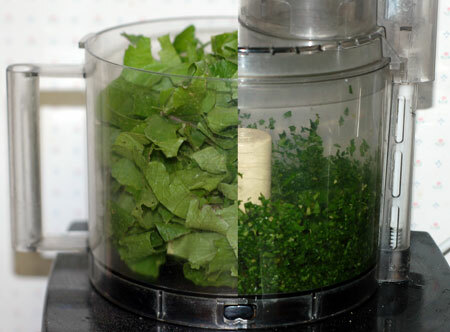 Add the mixture to a blender or food processor, and puree until smooth, adding water to adjust the consistency if necessary. Store in airtight containers in the refrigerator up to 2 weeks.